Acquiring Right of Way before Legislature approves Bridge project: Is the Cart before the Horse? Last month the Federal Highways Administration approved the KABATA’s expenditure of $15 million in right of way funds even though the project has no financing plan and the Record of Decision remains in court while the Municipality of Anchorage and the Knik Arm Bridge and Toll Authority (KABATA) seek to negotiate right of way through the Port. For a copy of FHWA’s release of funds form, click here. Government Hill property owners are receiving notice from KABATA that their property requires appraisal as a first step toward sale or condemnation, for a copy of August 19, 2011 letter from KABATA to a resident, click here. Right of Way maps from KABATA are available. To view the Anchorage side ROW maps, click here. To view the Mat-Su ROW maps, click here. Anchorage’s existing Long Range Transportation Plan (LRTP) 2027 incorporates the conditions the Anchorage Assembly made when the Knik Arm Crossing Bridge was added to the LRTP, only if no further state and local funds were needed and also requiring that a financial plan would be in place before construction activities took place. Government Hill Community Council President Bob French said the Mayor, AMATS and Assembly appear not to have been notified of the end run by FHWA and KABATA to go ahead with Right of Way acquisition without meeting the LRTP conditions. For a copy of the key conditions the Anchorage Assembly attached to the Bridge project in the LRTP, click here. Scott Goldsmith of the University of Alaska’s Institute of Social and Economic Research (ISER) noted that the ISER/Ch2M Hill forecast for Bridge traffic in 2035 was 17,700 trips a day while KABATA’s traffic consultant Wilbur Smith and Associates projects 36,000 trips a day in 2035, a number that is the basis for KABATA’s optimistic toll revenue forecast in their financial plan. The Technical Advisory Committee of the Anchorage Metropolitan Advisory Committee had requested KABATA to provide the Traffic Analysis Zone (TAZ) data that would help AMATS sort out the consistency and potential accuracy of the different population and traffic estimates. It was announced at the AMATS Technical Committee yesterday that KABATA has decided not to release the TAZ data, at $3,000 to release the data, and $10,000 to answer questions on how they came up with the predictions, KABATA decided it was just too expensive. For the power point presentation to the AMATS Technical Advisory Committee by Scott Goldsmith and financial analyst Jamie Kenworthy (Goldsmith slides labeled, unlabeled are Kenworthy) please click here. Finally, a statewide poll by Ivan Moore was released. The poll was taken of 621 registered Alaskan voters in June, 2011 before the Municipality suit on the right of way and before recent publicity that if the KABATA bills before the legislature are passed, the state would be responsible for making up any shortfall in toll revenue. 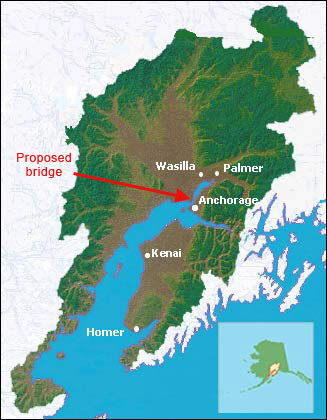 The poll showed that by a narrow majority, Alaskans approve construction of the Bridge but when asked if they support an additional $150 million of State Funds for the Bridge or a state guarantee for KABATA, the two key features of the KABATA bills before the legislature, a strong majority of Alaskans across political affiliation and geographic regions oppose further state support for the Bridge. For a copy of the poll, click here and for Ivan Moore’s statement, click here. On August 29, 2011, the Technical Advisory Committee of Anchorage Metropolitan Area Transportation Solutions (AMATS), the regional transportation planning agency, heard financial analyst Jamie Kenworthy summarize recent work by Scott Goldsmith of UAA’s Institute of Social and Economic Research (ISER) analyzing projected Bridge revenue. •	For the Seward/Glenn Highway to Highway project, ISER-CH2M HILL forecasted 17,700 vehicles daily crossing the Bridge in 2035 versus Wilbur Smith Associates (WSA) forecast of 36,000 vehicles a day which KABATA used to project toll revenue in its Financial Plan. If the ISER-Ch2M HILL forecast is correct, halving toll revenue will add $2.4 billion to the cost of the state’s guarantee, subject to annual appropriation, under proposed Senate Bill 80. •	Historically there has been a fairly constant 1-1 correlation between the rate growth in households in Anchorage and the Mat-Su Borough and the rate of growth in car trips between Anchorage and Mat-Su. The WSA forecast assumes that by 2035 there will be twice the share of trips per household between Anchorage and Mat-Su in 2035 compared to today. •	The KABATA Financial Plan assumes the revenue of a Phase 2 expansion of the bridge from 2 to 4 lanes without including the cost of Phase 2. Additionally, KABATA estimates the Phase 2 cost at $375 million but $835 million is the median number for Phase 2 that the Federal Highway Administration produced in 2009 through an estimation process which KABATA participated in. Plan is expected to have a public hearing in October and to go to the Planning and Zoning Commission and the Anchorage Assembly next winter. Please click here to view the AMATS presentation which contains slides by Scott Goldsmith of ISER and additional financial analysis by Jamie Kenworthy. KABATA estimates that the total amount of payments to the contractor over the life of the project before the bonds are paid off in 2051, is $3.2 Billion. Financial analyst Jamie Kenworthy has an alternative realistic cost estimate that puts that amount at $5.75 Billion. Click here to read the analysis. Today’s Anchorage Daily News article,State Expected to Cover Bridge Shortfall [Dead link- this article is no longer online], highlights KABATA’s financial assumption that the state would backstop the Bridge toll shortfall. Because AMATS, the Anchorage area regional transportation planning agency, is now developing the 2035 transportation plan to fund needed local transportation plans, the differences between these estimates of future Bridge costs may have to be resolved if the Bridge is kept in the 2035 transportation plan. The Anchorage Assembly is expected to approve the 2035 plan this coming winter with the Federal Highway Administration then reviewing it for “fiscal constraint”, the bureaucratic term for a plan that shows that all the included projects can be paid for with expected local, state and federal revenues. In short, choices may have to be made soon between the state financing the Knik Bridge and financing other identified local Anchorage area transportation projects. A suit was filed in Anchorage federal district court on July 5, 2011 by the Municipality of Anchorage asking for a declaratory judgement that the Final Environmental Impact Statement (FEIS) for the Knik Arm Crossing (KAC) violated the National Environment Policy Act (NEPA) Act and asking that the Record of Decision be vacated. The suit alleges that the FEIS had no “reasoned evaluation or study” of the conflict between the existing plans of the Port of Anchorage (POA) and the proposed Knik Arm Crossing. 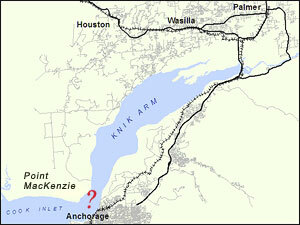 The Port of Anchorage serves 80% of Alaska citizens and is a unit of the Municipality of Anchorage. The suit alleges that the Federal Highway Administration, the lead federal agency over the KAC, did not adequately consider or address impacts to the POA; that the KAC did not adequately consult with the Federal Maritime Administration, the lead agency over the ongoing POA Project; that the KAC FEIS’s preferred alternative did not comply with the purpose and needs Statement set out in the FEIS; and that in preparing the FEIS, the Knik Arm Bridge and Toll Authority (KABATA) did not respond to documented POA concerns about the land conflict issues between the below-the-bluff access route chosen and the approved plans for Port expansion. Read the full complaint here. The bills to provide the Knik Arm Bridge and Toll Authority (HBs 158 and 159 and SBs 79 and 80) with a state guarantee to cover any toll shortfalls to the project’s private investors squeaked through the transportation committees of both houses of the Alaska legislature with fewer yes votes than bipartisan no report abstentions. The bills did not receive a hearing in either body’s Finance Committee and they never came to the floor for action. The Knik Arm Bridge project was not included in the capital budget that passed the legislature and is now awaiting disposition by the Governor. Scott Goldsmith of the University of Alaska raised concerns to the Chairs of both Finance Committees about the validity of the population and traffic estimates used to project toll revenues. KABATA’s pro forma financial plan submitted to the federal government on March 1, 2011 for a federal low-cost loan letter of interest application projects $3.2 billion in availability payments over 35 years to a private partner to finance and build the proposed bridge. Since that financial projection depends on population and toll estimates 40-50% higher than independent sources (see Kenworthy testimony), it is expected that the size of state liability present in these bills will be a key issue for next session if HB 158 and SB 80 are considered further. KABATA’s operating budget for the fiscal year beginning July 1, 2011 was approved by the state legislature. KABATA will be presenting the project to potential investors in New York next month at an annual Public-Private Partnership Conference. Click here [Dead link- The KABATA web site is no longer online.] for information about KABATA’s workshop. KABATA has canceled its previous bridge construction procurement which had a two stage process that included preselection of two teams for final procurement. What appears clear is that KABATA had to redo the procurement process to provide a state guarantee for any potential private investors. Do spreadsheets make your eyes glaze over? Here’s an annotated version of KABATA’s financial plan that shows the gaping holes in the proposed bridge’s financing scheme. House Bills 158 and 159 and Senate Bills, 79 and 80 not only give the Knik Arm Bridge and Toll Authority a substantial down payment of $150 million, but they also ensure that the State of Alaska guarantees $3.2 billion in “availability payments” to a private investor. Senator Thomas had some wonderful questions for the Attorney General, the Department of Transportation and Public Facilities and the Department of Revenue discussing the impacts these bills would have on state finances, the state’s ability to fund needed transportation projects, and on the state’s future bonding ability. View the Background Documentation for the 5-minute “ Nick Bridge Goes to the Bank” YouTube video, above. Click here [Dead link- The KABATA web site is no longer online.] for the Knik Arm Bridge and Toll Authority’s low-cost federal “TIFIA” loan application, submitted on March 1, 2011.